This page: Learn classroom vocabulary, school subjects, and titles. Select the name of the object. 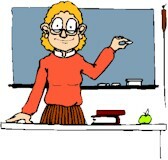 Select the school subject that the teacher is talking about. Teacher - What is 3 + 3? Teacher - Book is spelled B - O - O - K.
Teacher - Students, paint a flower on your paper. 7. late schedule first great lunch last bell Me too. Helen - My first class is at 8:00. Mario - It's 8:15! You're _______. Maria Ortiz - My name is Maria.